Yum! Saisons! Tonight's saison is the 2013 edition of Sophie Sofie Belgian Style Farmhouse Ale by the folks over at Goose Island Beer Co. out of Chicago. Anheuser-Busch and others are scared of the increasing popularity of craft beer and since their market share has gone down a bit, they've started to buy reputable microbreweries all over the United States in Canada. In 2011 Anheuser-Busch InBev purchased the brewery to secure territory rights and to help control even larger part of the beer market in the States. Appearance: Sophie Sofie pours a very cloudy pale lemon-yellow with a bit of a soapiness to it. Insane amount of carbonation.. I can hear a bit of a fizzing taking place even a few months after the beer has been poured. Very minimal head, there's a light amount of off-white foam touching the sides of the glass but that's about it. Aroma: Very citrus-focused on the nose. A nice lemon zest giving it a bit of a sour aspect to it, Belgian yeast, orange peel, light hay aroma and lightly peppered. More of a sour zest to it than most saisons I've had. Taste: Very solid saison. Sour lemon citrus zest, orange peels, good abundance of yeast, some notes of champagne and a light grainy note to it for aftertaste. Overall Thoughts: More of a sour saison than most saisons I've had. I've only had one saison that was anywhere near in sourness and that was at a brewpub in Quebec City. Nice light on-the-palate saison that has an abundance of citrus flavours and great for a chilly evening like tonight. Considering that Anheuser-Busch InBev owns this brewery, you would likely never notice. 6.5% ABV and Sophie Sofie can be aged in bottle for up to 5 years, which would be an interesting beer experiment. 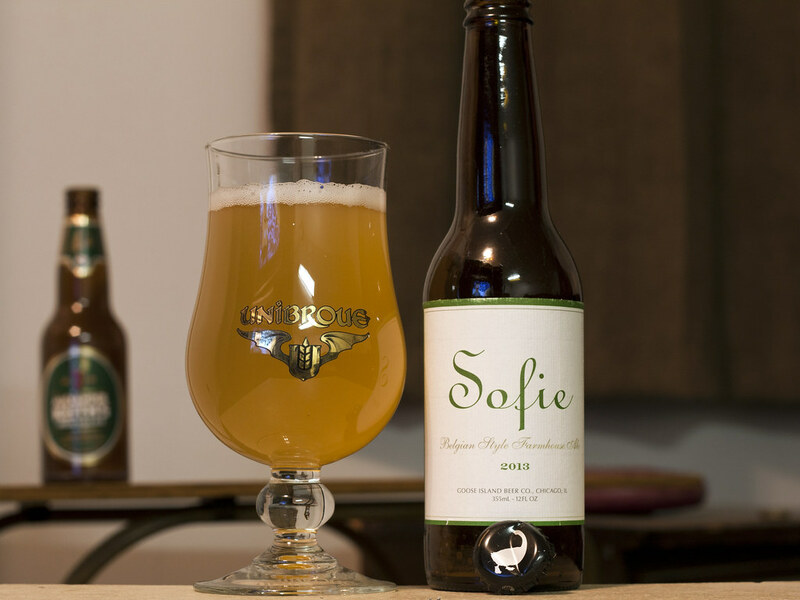 Edit: April 2015, I incorrectly wrote Goose Island's Sofie as Sophie, I never even noticed until now. Also: Goose Island's Sofie & Matilda beers are now available in 765mL wine-like bottles all over Manitoba at Liquor Marts in Brandon, Virden, Neepawa, The Pas, Winnipeg and beyond!